In this episode, Sara Anna is joined by special guest expert Wisdom Moon. Wisdom is the founder and former owner of All About Worship and Kingdom Songs, and a pioneer in creating worship leader resources. He has more than 20 years of ministry experience and over 13 yeras of marketing and business experience. Wisdom has worked with many successful artists and businesses including Lauren Daigle, All Sons & Daughters, MultiTracks.com, Integrity Music, and Gateway Worship. He is the Founder and President of Marketing with Wisdom, a faith-based marketing agency passionate about providing clear and effective marketing strategies. Sara Anna and Wisdom share a lively conversation about being willing to follow God’s direction in business even when it feels a little (okay, a lot) out of your comfort zone. You’ll be enriched by this transparent episode on how taking Kingdom-minded risks can yield God-gifted rewards. Also, grab Wisdom’s FREE social media calendar template at www.indieartistuniversity.com by clicking on the Access Courses Now tab and scrolling to the bottom of the page. If you’ve enjoyed this podcast, please leave us a rating and review on Itunes. It’s how we get heard by new listeners and make a bigger impact in the world. This episode is special! Sara Anna did a training on FB that was such a hit that she’s sharing it again here on the podcast. If you’ve ever spent hours crafting a compelling email to your audience only to have abysmal open rates, this episode is for you! Sara Anna walks you through four specific categories of subject lines you can use in your email messages that will inspire people to OPEN and actually READ your emails. You know, so they can get the help they need through purchasing your programs and services. If you love this episode and you want to take this learning deeper, you should know that Magnetic Messaging™ is open for ONE WEEK ONLY, April 12 - 18, 2019. Magnetic Messaging™ is Sara Anna’s signature group mentoring program that will help you craft all the copy you need to succeed as an online coach, consultant, or service provider. This LIVE round of the program includes nearly $8000 in bonus support, so make sure you grab your seat while you still can. In this episode, Sara Anna gives you the WHY and the HOW around developing your signature story. Having a go-to story will connect you with your ideal clients in a meaningful way, and connection is your first step on the pathway to conversion. The Challenge is FREE and begins April 8! You’ll learn how to take clients from connection to conversion in seven simple steps. Also, if you’re enjoying the podcast, please give us a rating and a review! This helps us get heard by more people who want strategies for building a profitable online business while keeping their faith front and center. Sara Anna welcomes her #1 copywriting mentor, Ray Edwards, to today’s podcast episode. Ray is a Communications Strategist, Copywriter, and the author of How to Write Copy That Sells. His podcast, The Ray Edwards Show, is consistently one of the top-ranked shows in iTunes and has been downloaded over 1 million times. Ray has worked on copy and marketing with some of the most powerful voices in leadership and business. He's helped generate an estimated $300 Million in revenue for clients like Tony Robbins, Michael Hyatt, Dan Miller, Jeff Goins, Jack Canfield, Frank Kern... and many more. He's been featured on Forbes.com, SocialMediaExaminer.com, and Entrepreneur.com. Sara Anna and Ray dig deep into the power of storytelling, navigating risks in business, and the importance of taking radical responsibility for your life. Ray also shares how you can get a free, signed copy of his bestselling book! Ep. 050 - The 50th Anniversary Episode! 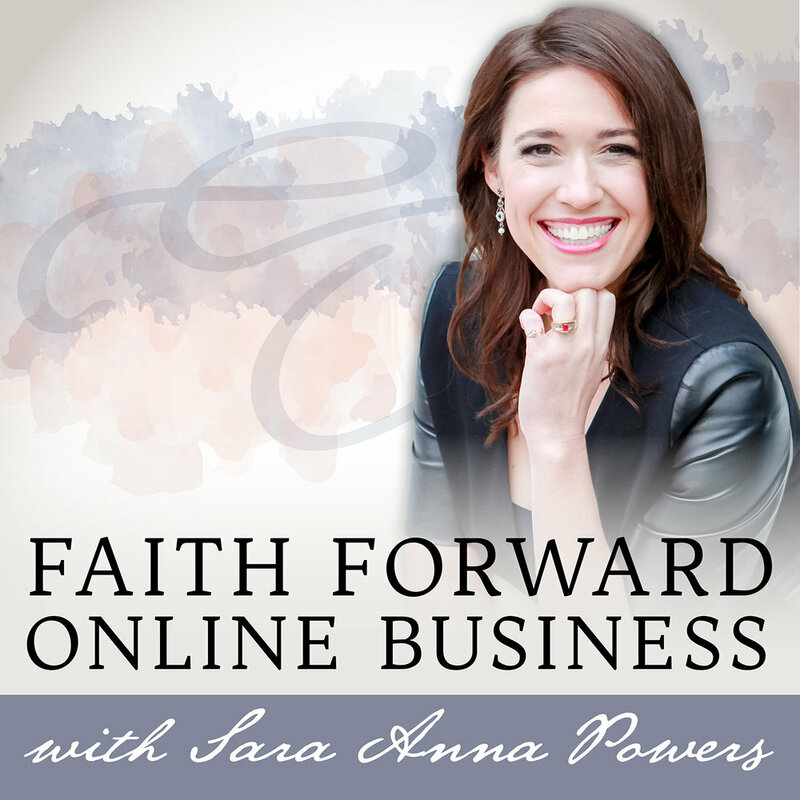 Sara Anna celebrates 50 episodes of the Faith Forward Online Business podcast in this week’s episode. This one isn’t like any other episode you’ve heard from this show. Sara Anna lets you into the heart behind her business, her big why (you may be surprised), and shares some super special personal details. This episode also includes her favorite ever verse of the week -- which happens near the end of the episode. This one is a can’t miss. And if you’re interested in the Faith Forward Business Academy, Sara Anna’s brand-new, six-month, fully comprehensive online business-building program, you should know that spots are already filling up. Email anna@saraannapowers.com for more details and to determine if you’re the right fit for the program. In this episode, Sara Anna invites fellow Inner Circle Mastermind member Theresa Loe onto the show. Theresa is a Team-Building and Digital Marketing Coach for online entrepreneurs. She helps CEOs find, grow and lead their best Executive A-list Teams so they can get their life back and still scale their company. Sara Anna and Theresa talk about how important it is that you be open to pivoting in your business, and why you need to let go of control in order to build a lasting company. Plus, Theresa shares a 4-step strategy on how you as the leader can equip any team member to do his or her job with complete confidence. Sara Anna discusses the importance of taking consistent actions to grow your online business in this week’s episode. This isn’t always the glamorous stuff, but these are the efforts that will yield positive results over the long-term. Sara Anna shares the specific actions she consistently takes to nurture her audience and grow her business, and shows you how you can do the same in your own business. And the brand-new Faith Forward Business Academy, an intimate six-month group coaching experience designed to help you create a profitable online business that aligns with your faith and values. Email Sara Anna at anna@saraannapowers.com to discuss enrolling as an early-bird for the best rate. Erin Mullins Sanderson a/k/a Fit Rocker Chick joins Sara Anna on this week’s episode of Faith Forward Online Business. Erin’s a bona fide rock chick who’s built an online empire based on authenticity and passion. She’s an internationally recognized thyroid health advocate, style influencer, non-toxic beauty junkie, skilled musician, and online personality. She’s shared the stage with acts like Evanescence & Halestorm, with songs featured on MTV, Keeping Up With The Kardashians, Fuse TV, and more. With an online reach over 300,000, and cult following in her “Shes A Rock Chick” girl gang - her fiery approach to life that has allowed her to help thousands of women gain confidence and create a space for them to reinvent themselves. When Erin is not hanging out with her bearded hunk, fur babies, or her virtual girl gang... she’s either watching Lord of the Rings, researching a natural alternative for Botox, or buying tickets for Aerosmith’s upcoming Vegas residency. In this episode, Erin gives us all the deets about how she transformed from touring musician to million-dollar CEO without losing her originality or individuality. She also gives us the inside scoop on her new membership, She’s a Rock Chick, including a super-special backstage pass inside the group! And to join her membership, email Erin at hello@fitrockerchick and give her the secret password Purpose! P.S. If you’re loving this podcast, please take a minute to leave us a rating and a review. This helps the podcast get seen by those who need support in growing their faith-forward online businesses! Connect with Sara Anna via www.saraannapowers.com/success and grab her free workbook and audio guide on success strategies you can use daily. Sara Anna is joined by the CEO of Socialize LA for a discussion on the importance of visibility in growing your online business. Margaret Hernandez Brown is the founder and CEO of SocializeLA.com, a full-service digital marketing and training agency. Margaret helps build profitable digital strategies. She is so passionate about digital that she created: The #FlexYourInfluence Membership site to be able to offer guidance to those doing their own digital marketing. Today, SocializeLA.com has experienced explosive growth while helping clients achieve success. Margaret travels around the country providing training, guidance, and management to organizations. Margaret and her team prove that "There's Value in Getting Noticed." Learn more about Margaret’s social media membership site where she supports you in all things digital marketing here: http://www.flexyourinfluence.com Enter the code PODCAST to get a free month trial of the membership! In this episode Sara Anna is joined by Rachel McMichael, a business strategist and coach who helps female entrepreneurs leverage the power of Facebook Advertising and breakthrough their business ruts to launch and scale their online businesses. Through her signature programs, The acADemy Course and the Business Breakthrough Group Coaching Program, and her podcast, Business With Impact, Rachel works with driven entrepreneurs to bring them the strategies they need to build a business that allows them to live the life they love while still creating a massive impact. Sara Anna talks about how your beliefs, thoughts, and emotions will absolutely shape your reality and challenges listeners to examine and shift thoughts that might be holding them back. Enjoy the verse of the week: “Let us not become weary in doing good, for at the proper time we will reap a harvest if we do not give up.” Galatians 6:9. Sara Anna offers live trainings each week inside her free Purpose-Driven Women Facebook Group. If you’re a faith-centered woman looking to grow your online business, you’ll want to join. And if you’d like to overcome beliefs that are blocking you from making the sales - and therefore the impact - you desire in your business, grab Sara Anna’s Stellar Sales in 5 Simple Steps Training here: http://www.saraannapowers.com/simplestellarsales Use the code FFOB for 50% off! In this episode, Anna shares her 18 top business (and life) lessons from 2018. This one is value-packed, so try to listen where you can jot down notes! Anna’s journal she mentioned that she uses to dig into God’s word daily is here: http://www.saraannapowers.com/writetheword *Anna is an affiliate for Lara Casey and will receive a commission from purchases made with this link. To get Anna’s Stellar Sales in 5 Simple Steps Mini-Course for $50 off (more than half off the regular course rate), click here: http://www.saraannapowers.com/simplestellarsales and enter the code FFOB at checkout. Sara Anna is joined by former WWE Superstar Kris Pavone in this week’s episode. The conversation ranges from going after your dreams, to trusting God’s timing, to finding mentors who can accelerate your journey. Tune in for this faith-focused conversation about making your life even better than you’ve imagined. Find Kris online and find out how you can work with him at https://www.krispavone.com/ Tune in to his podcast, The Kris Pavone Show, on Itunes, Google Play, or Stitcher. Ep. 040 - How Do You Choose A Mentor? In this episode, Sara Anna talks through the 4 questions she asks when choosing a mentor plus the 2 surprising things she DOESN’T consider when hiring a coach. Mentorship can massively accelerate your success, but only if your choice is in alignment with your true values and goals. Asking the 4 questions in the episode can help ensure that you choose a support team who will help you get to the next level in your business and life! Sara Anna shares her personal prayer discipline in this episode of the Faith Forward Online Business podcast. Prayer can revolutionize your personal relationship with Jesus, and having a regular practice around it will give you freedom to experience a deeper faith. For this episode, Sara Anna is joined by James Wedmore, a multi-7 figure online entrepreneur who understands that mindset and business growth are inseparable. James went from hustle, stress and struggle to ease, flow, and IMPACT in his own business, and now he helps other entrepreneurs do the same through his Business By Design program. James also had a massive personal impact on Sara Anna’s life, and you’ll hear the backstory of how your host transformed her business using James’ guidance and strategies. Connect with James on Instagram at @jameswedmore and don’t miss his video series - it’s only available for a limited time! And as always, if you loved this episode, please give us a review and rating on Itunes. It helps us get heard by more people who need these tips, techniques and strategies! Thank you for your support. We are grateful! Sara Anna is joined by Dillon and Sarah King, founders of http://www.withthekings.com for this episode of the Faith Forward Online Business podcast. By creating and selling courses, they have made over a million dollars in sales while working less than 5 hours/week. They believe in family first, and with (almost) 4 children under 4, they are so thankful for their business, because it has given them the freedom to be fully present parents. After experiencing this success, Dillon and Sarah have become committed to supporting others in creating + selling their own courses. Dillon and Sarah believe that everyone knows something that others would pay to learn. Their signature program, Launch, helps entrepreneurs find "their thing" and monetize that knowledge through their own online course. Dillon and Sarah have made it their goal to remove the mystery of making money online. They believe anyone who is willing to work hard for a freedom lifestyle, should have the tools to make it happen. Learn more about their business model (including a detailed financial breakdown) in their free video series. Get their free video series here: http://withthekings.com/podcastgift. And we’d love it if you’d give the FFOB podcast a rating or review over at itunes! It helps our show get heard by the listeners who need it most. In this episode, Sara Anna welcomes Dr. Annette Stephenson to the show. Dr. Stephenson runs the only audiology clinic on The Cayman Islands and recently began following a divine assignment to empower women after her own personal tragedy.